Truva Linux was a Turkish distribution based on Slackware Linux. Rate this project STUX 0.7 has been released: "Changes: user 'gp' removed: now applications run with root privileges; MiniDesktop 0.1 released: MiniDesktop is an application that uses graphical interface to perform all operations required to manage Live CD sessions (devices setting, configuration save, hard disk installation, ...); all STUX codes have been rewritten and included in MiniDesktop; introduced Cheat Codes: Cheat Codes are used to pass values to STUX, to help with getting it working on difficult hardware, start with a different desktop manager, set root password, debug, ... (press F1 at boot prompt for a list of available Cheat Codes)..." See the rest of the changelog before heading for the download page (a download agreement is required). STUX GNU/Linux is a live CD project based on Slackware Linux. STUX GNU/Linux 2.0, a Slackware-based live CD and DVD, has been released: "STUX GNU/Linux 2.0 released." What's new? "Upgraded to Slackware current as at 20 August 2008 (Slackware 12.1) and KNOPPIX Live DVD 5.3.1 (kernel 2.6.24.4). Released STUX GNU/Linux on DVD. Includes full Slackware installation (series a, ap,d, kde, kdei, l, n, x and xap), full kernel sources, several extra games (Nexuiz, Ufo:ai, Wesnoth, Sauerbraten, Torcs, Tremulous, Warsow, Unreal Tournament Demo, Quake 3, Warzone, BzFlag, TuxRacer, SuperTux) and applications (OpenOffice.org, Eclipse). STUX-Utilities updated. Some packages removed from CD edition (Java, Azureus). All packages are now installed on DVD edition." Visit the distribution's news page to read the release announcement. Download (MD5) the live CD or live DVD image via BitTorrent: stux-linux-2.0-CD.iso (697MB), stux-linux-2.0-DVD.iso (3,982MB). STUX GNU/Linux 1.0, a live CD based on Slackware's "current" tree, has been released: "STUX GNU/Linux 2007 (version 1.0) released." From the changelog: "Upgraded to Slackware current as at 1 Jun 2007 and KNOPPIX live CD 5.1.1 (kernel 2.6.19); fixed problem with installation on SATA hard disks; all STUX utilities deeply reviewed; NVIDIA proprietary driver updated to 1.0-9755 + legacy driver 1.0-9631 for old cards; save live CD persistent configuration on ReiserFS partitions; install compressed image on ReiserFS partitions; Acx wireless firmware upgraded; fully integrates with other pre-installed operating systems; Compiz 0.5.0; fully VMware/QEMU compatible." Visit the project's news page to read the release announcement and changelog. Download via BitTorrent: stux-linux-1.0.iso (696MB). A new version of the Slackware-based STUX GNU/Linux live CD has been released. What's new? "Based on Slackware current as at 8 October 2006 (Slackware 11.0); Linux kernel upgraded to 2.6.17 from KNOPPIX CD 5.0.1; KDE, and all programs executed from KDE, now run as unprivileged user; user management, also when running from live CD, is more sophisticated; various services have been hardened; added udev, Tor, 3D-Desktop, MPlayer, Icecast, lm_sensors, Lopster, wpa_supplicant; now using wireless and network initialization scripts from Alien BOB; all STUX utilities reviewed and enhanced; faster boot; enhanced wireless networking support; many other changes, fixes and enhancements." Visit the project's news page to read the release announcement and changelog. STUX 0.9.2 is available for download via BitTorrent: stux-linux-0.9.2.iso (654MB). A bug-fix version of STUX GNU/Linux has been released - just four days after the developers of the Slackware-based live CD released version 0.9. What's new? "Removed automatic configuration for NVIDIA video cards. Autoconfiguration caused problems for some models of NVIDIA video cards. Now, to load NVIDIA official drivers, you have to explicitly use the boot option 'nvidia'. Updated kicker sidebar image that was forgotten reporting STUX version 0.7. Removed some directories from the root folder." Visit the STUX news page to find a more detailed list of features and the most recent changelog. The new STUX GNU/Linux release is available for download via BitTorrent: stux-linux-0.9.1.iso (669MB). Giacomo Picconi has announced the release of STUX GNU/Linux 0.9, a Slackware-based live and installation CD designed desktop use: "STUX GNU/Linux 0.9 released. Main changes: Linux kernel upgraded to 2.6.12 from KNOPPIX CD 4.0.2; based on Slackware current as at 10 June 2006; added KNOPPIX hardware autodetection; Unionfs: with Unionfs it's now possible to use STUX from Live CD without the read-only limitation; all STUX utilities fully debugged and reviewed; multimedia keyboards now working and configurable; added WINE; installed remastering tools; Wi-Fi and Bluetooth support...." Read the complete changelog on the project's news page. STUX GNU/Linux 0.9 is available for download via BitTorrent: stux-linux-0.9.iso (675MB). STUX GNU/Linux 0.8.1 has been released. The new version is a quick bug-fix update to the new 0.8 series, which the developers launched a week ago. Some of the new features include: "Based on Slackware Linux 10.2 and KNOPPIX 3.7 for kernel and modules; all procedure and interfaces have been substantially reviewed; added boot option 'toram' to load STUX image in RAM and run from there; STUX Network Panel added - configure network for dial-up, ADSL, ethernet and wireless connections; STUX Media Center added; USB support enhanced; hard disk and USB installation process enhanced; created BitTorrent UI, also integrated in Firefox...." See the project's news page for a complete list of changes. STUX GNU/Linux 0.8.1 is available for download via BitTorrent: stux-linux-0.8.1.iso (695MB, MD5). Version 0.6.3 of STUX GNU/Linux has been released. Changes: "Fixed bug that prevented access to disk partition used to save configuration file (for FAT32 partitions only); fixed bug in Mozilla package that prevented location bar to work properly; Mozilla 1.4 upgraded to Mozilla 1.5; updated cloop; new look and feel; introduced a new experimental service that lets you download and install 'stux packages' (applications configured to work with Stux Live CD)." See the full changelog for further details. For downloads, please visit the distribution's download page to accept a download agreement (ISO image size: 620MB). A new version of STUX GNU/Linux is out. From the changelog: "Version 0.6.2 released. Changes: corrected a permission problem on scanner device file; syslog daemon is configurable; it is now possible to install STUX on hard disk without a missing STUX configuration; g++ added." To download the new release, please visit the distribution's download page to accept the STUX download agreement (the ISO file size is 618MB). 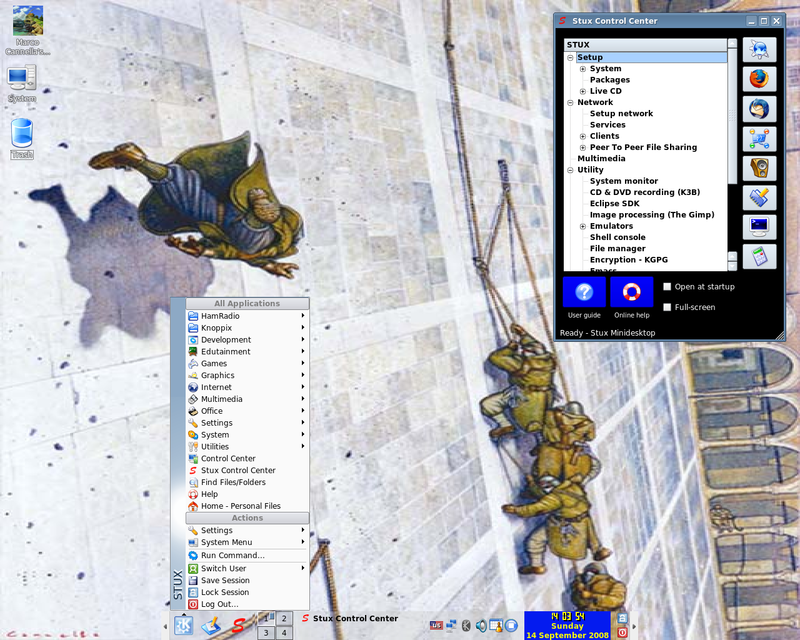 STUX is a Linux live CD based on Slackware Linux.